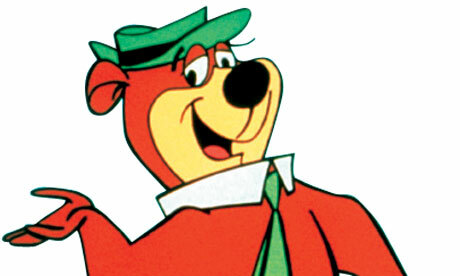 I awoke before dawn and felt the wind on my face. The forecast last night had been reasonable for a solo kayak excursion with a 10 knot breeze predicted in the morning. Standing on the cliff it felt strange indeed with wind seeming to shift and swirl and certainly well above 10 knots. Maybe it would ease at dawn as it often does along this coast. Indeed a fickle wind. 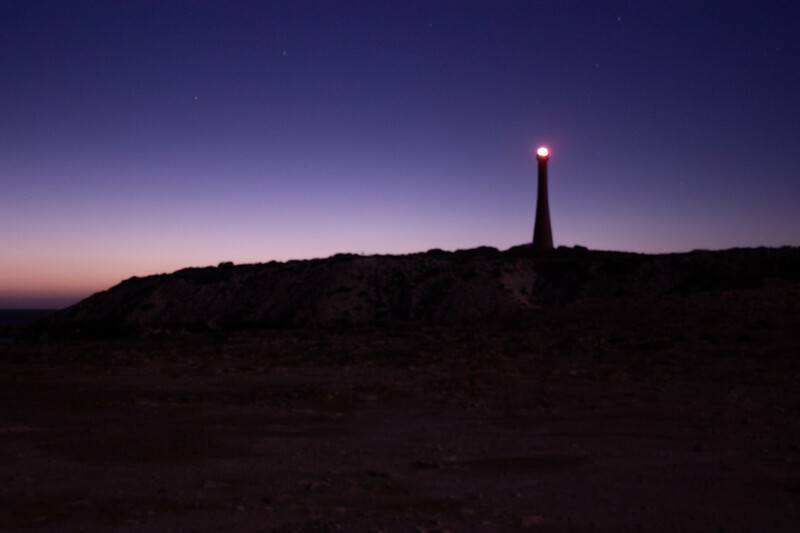 The lighthouse on Troubridge Hill was still beaming seaward and stars were still visible in the sky as I made my way to the launch site. As the sun rose I had a better idea of the conditions from my protected bay, with the wind gusting to 15 knots close inshore. 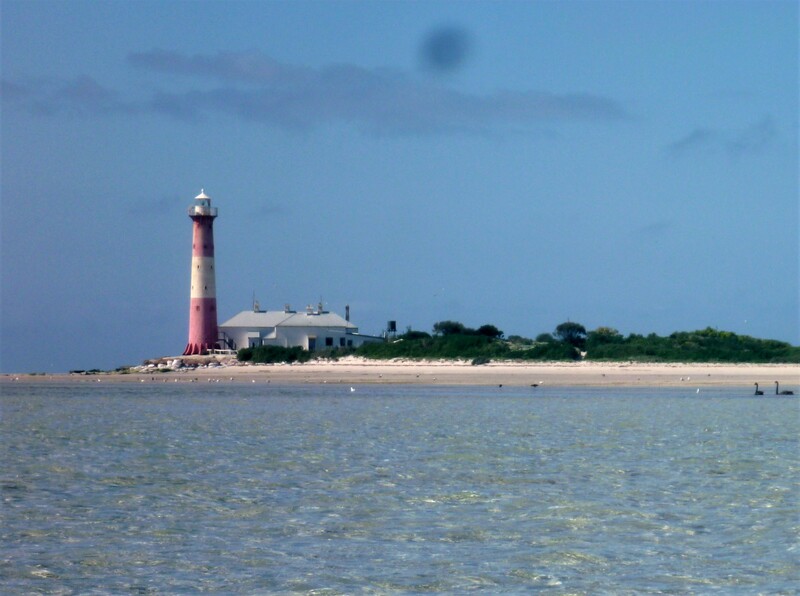 The binoculars showed confused conditions further offshore with standing waves tossing about on the Troubridge Shoal which I needed to traverse if I was to visit Troubridge Island and its’ heritage lighthouse. I consulted with a local and it seemed not likely to ease any time soon and suggested I find a sheltered spot to enjoy the day . 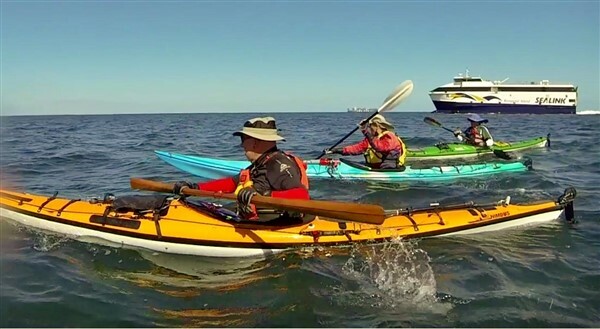 Paddling solo is always full of challenges especially when my route was 8km offshore traversing the Troubridge Shoal which had been the site of so many shipwrecks and groundings. I sat and waited for a while hoping to see some improvement in the conditions but there was none. 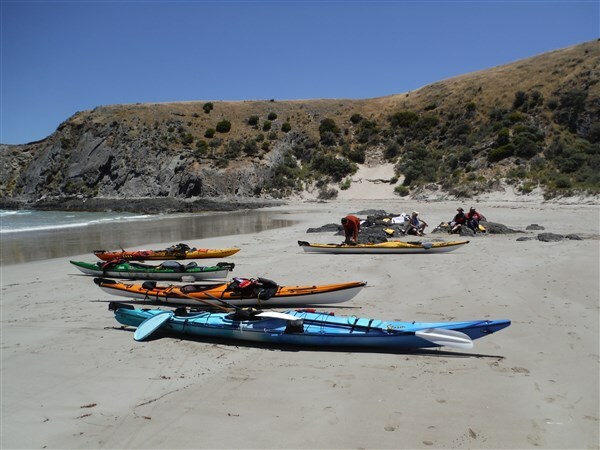 ..or I could hit the beaches on the Fatbike or paddle along the more protected section of the coast, staying well inshore. The Paddle idea won out so I put on the coffee and relaxed a while. I launched at the Edithburgh marina finding that I was the only vessel heading out today. 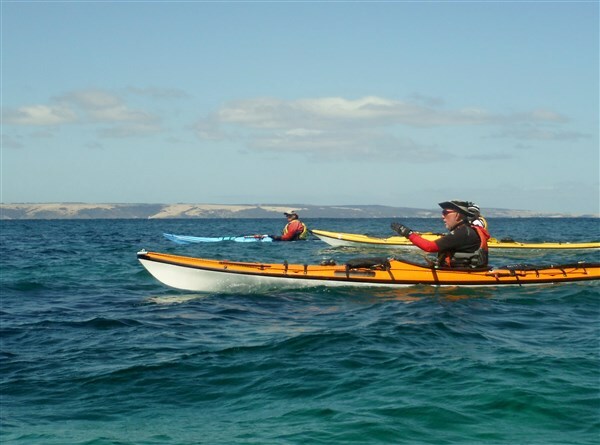 The plan was to head north towards Wool Bay visiting Coobowie along the way and depending on the wind paddle back or be collected by Robyn. 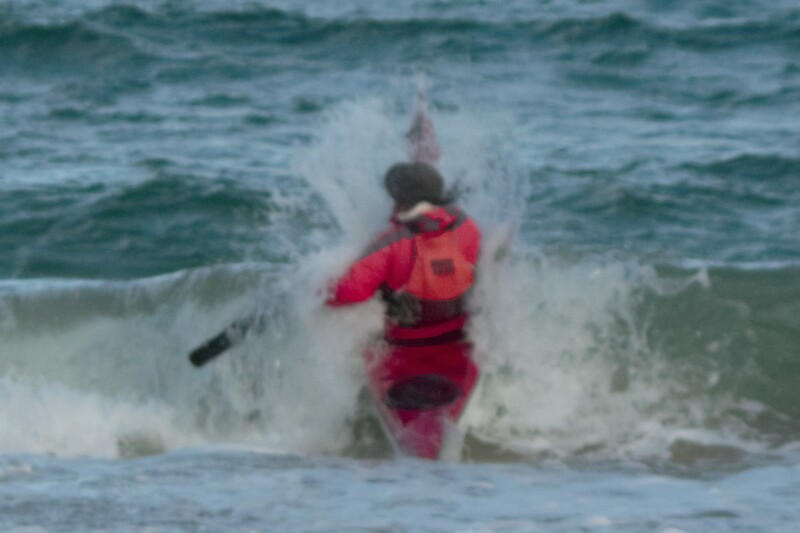 I was soon out into a 12-15 knot tailwind which sent me rocketing along the coast past the Sea Swimmimg Pool which had a population at this time of day of one. Robyn and I had visited the pool the previous night when conditions had been calm and the temperature warmer. 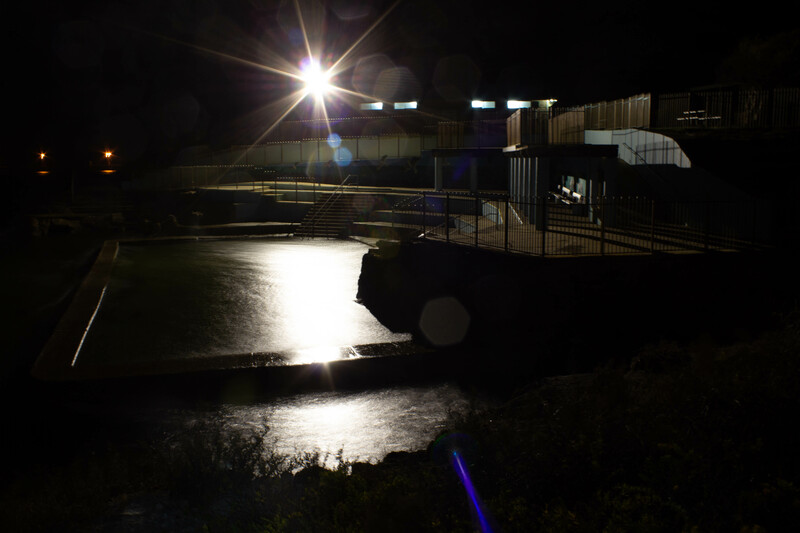 The Pool at night was a nice place to relax. 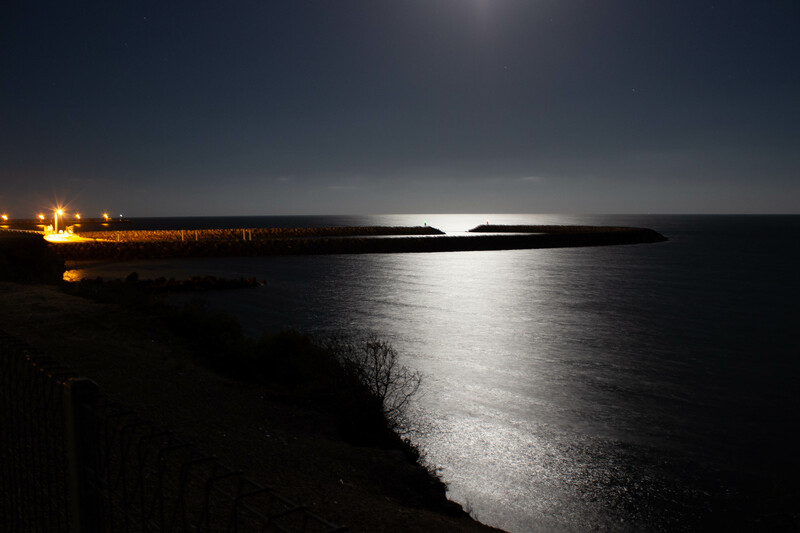 The marina was also calm last night with the moon reflecting on the water. 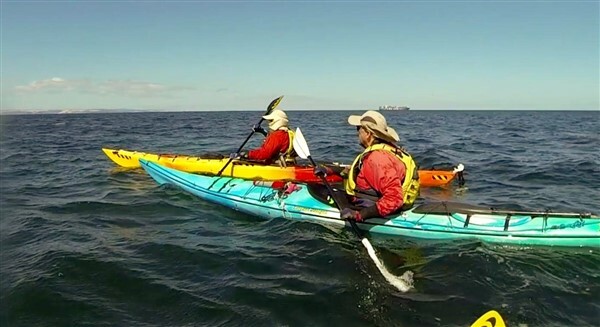 I was soon gliding along enjoying the exercise in company with a local dolphin pod. Unfortunately they were camera shy because as soon as I stopped paddling and grabbed the camera they shot off underwater. 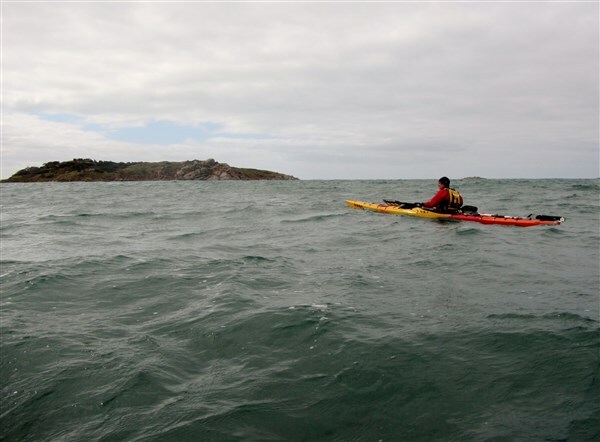 The waters close inshore can be shallow with jagged limestone outcrops to keep you on your toes but overall I had quite an easy down wind paddle towards the oyster beds at Coobowie. I weaved in and around them enjoying the clear water. I spotted a variety of fish as well as stingrays in the shallows and an interesting “foul ground” marker. The float is an aluminium beer keg. Hope they emptied it first. I ventured further along the coast before turning for home and into a headwind. The return trip was quite uneventful as I stayed in close inshore and out of the worst of the headwind. 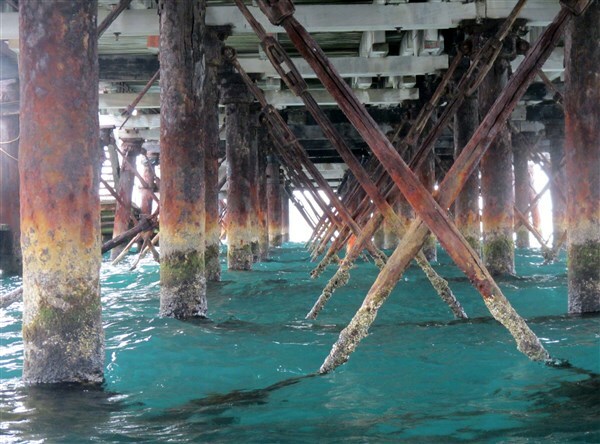 Returning to Edithburgh I paddled under the jetty noting the damage done by recent storms. 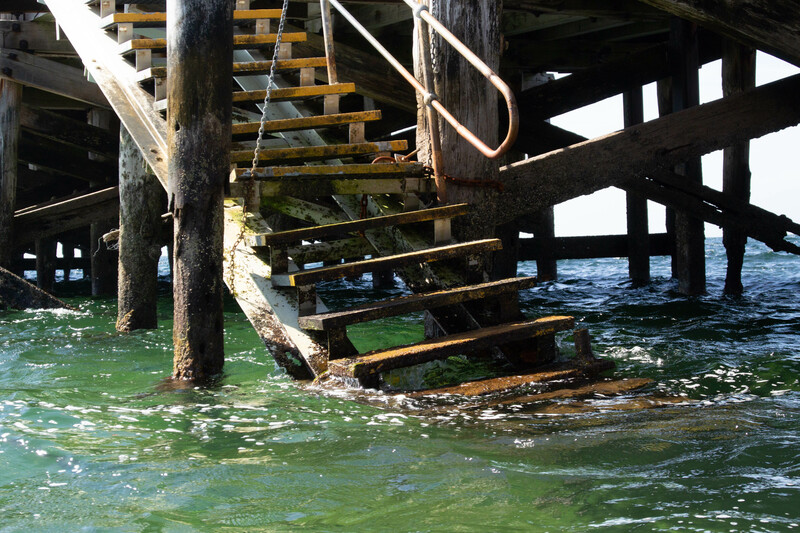 The stairs are closed and held together with chains and strong ropes. I landed quietly in the marina being the only person to be seen. 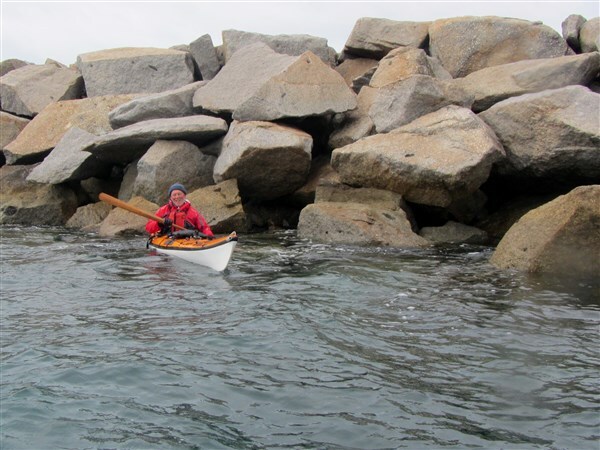 My solo paddle to Troubridge Island and it’s historical Lighthouse will have to wait until another day. 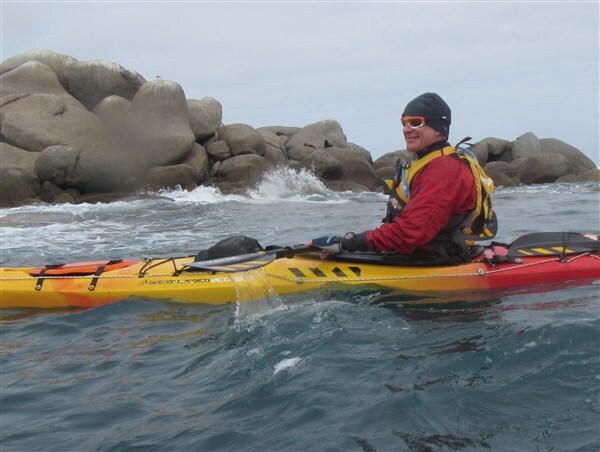 Training for Disaster is a philosophy I try to encompass in all aspects of my training as it helps me push the boundaries of my dwindling kayaking skills. 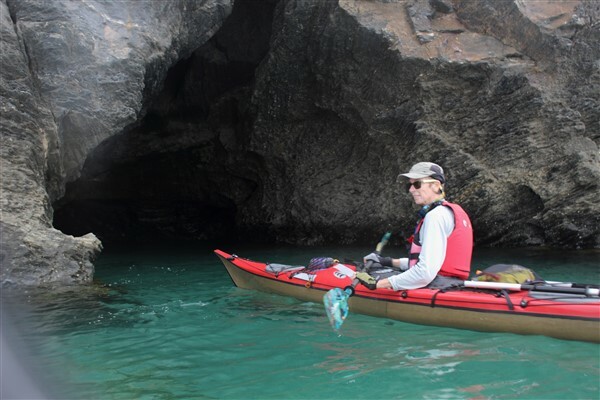 I try to look at my kayak skills in different ways and identify the right way and the wrong way. Sometimes it helps to get it wrong in order to improve. 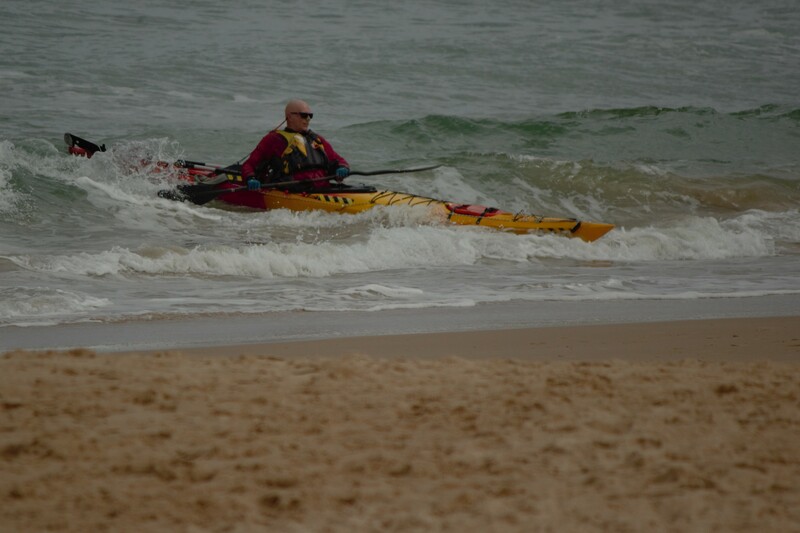 When practicing landing in surf I do it the right way, waiting for a smaller wave to pass under me then paddling after it to chase it shoreward, sliding gracefully up onto the beach and the wrong way, catching the wave, usually broaching the seakayak and having to support stroke as it is bounced along. 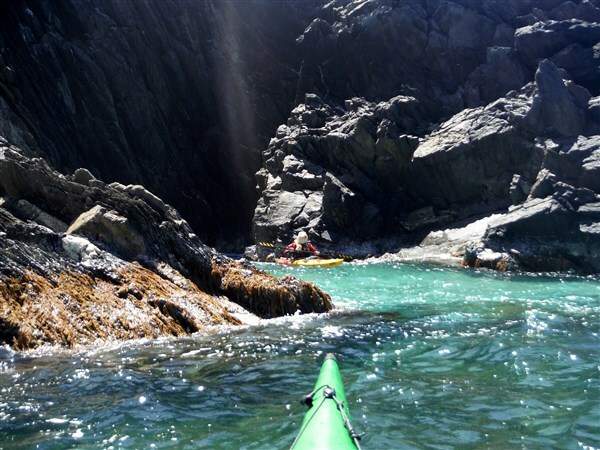 Paddle onto the back of a small wave and follow it to shore. Get it right and you will slide gently onto the sand. 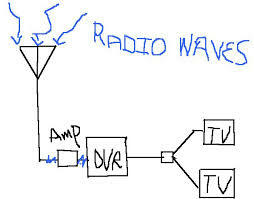 Pick the wrong wave and you might meet disaster. 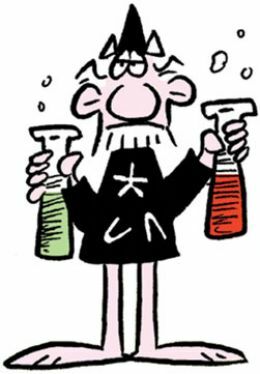 Practicing for the times that you get it wrong will increase your confidence and your ability to recover after errors of judgement and can even make for a lot of fun. 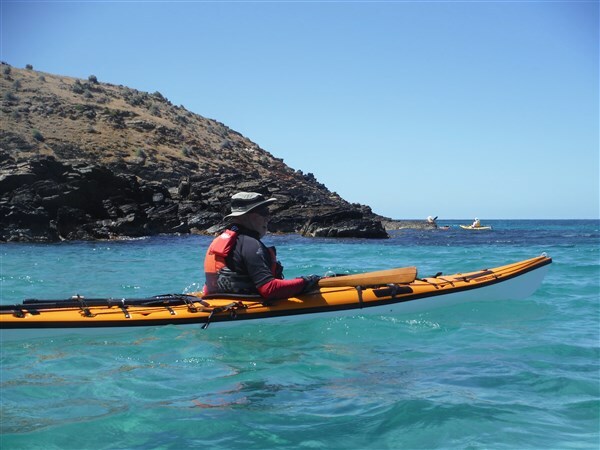 You don’t need huge waves to improve skills so try to practice every time you go kayaking. 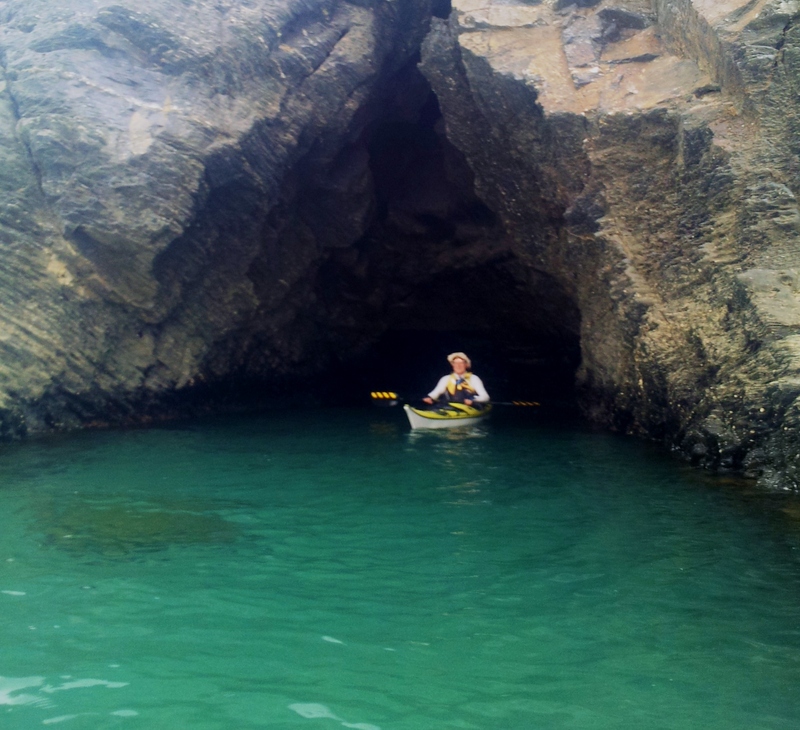 Often the fun can be just getting out there….. I was trying to stay dry today !! 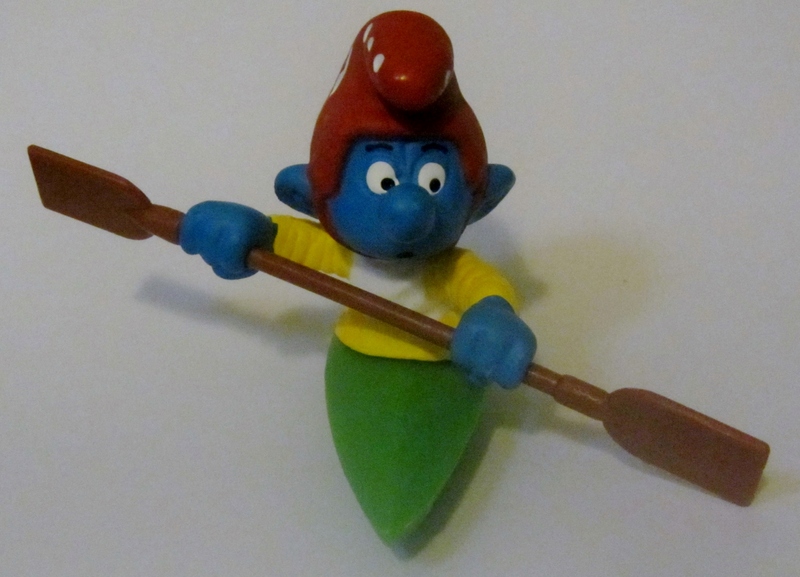 Then there are paddlers I know who don’t need to “Train For Disaster”. 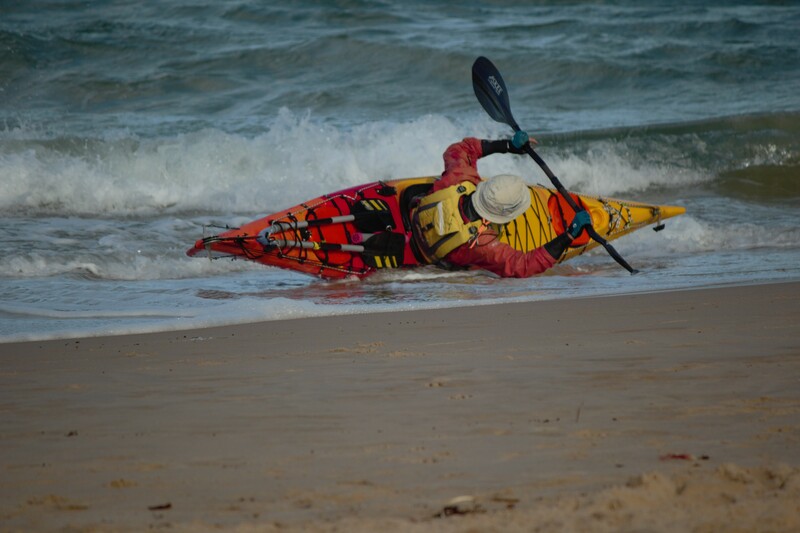 Disaster is their middle name and part of their everyday paddling life, providing lots of fun moments, some of which are caught on camera like this one. Another 38°C (100° F) day was forecast, just rounding out another week of heat. So what to do today ?. The last week had seen strong, hot winds blowing across the Adelaide Plains but today was different. NO wind or just a gentle breeze perhaps, so it was load up the kayak and hit the water. And indeed there was NO wind or maybe just a wisp of a breeze, hardly enough to evaporate the sweat from the brow but perfect conditions combined with an extremely low tide to do a little exploring. The sky was overcast, covered with tropical layers swirling from the north. 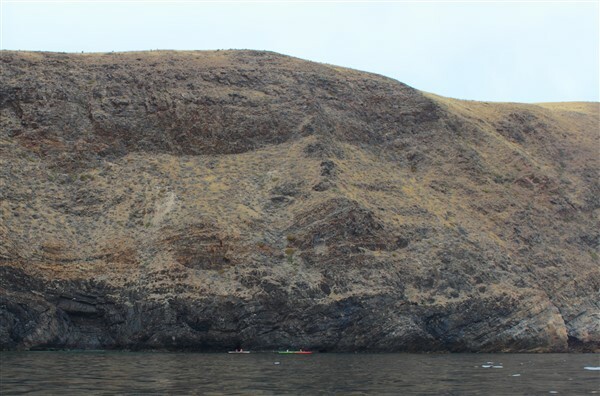 The horizon blended into the sky making an eerie landscape and the cliffs stood dark and quiet. 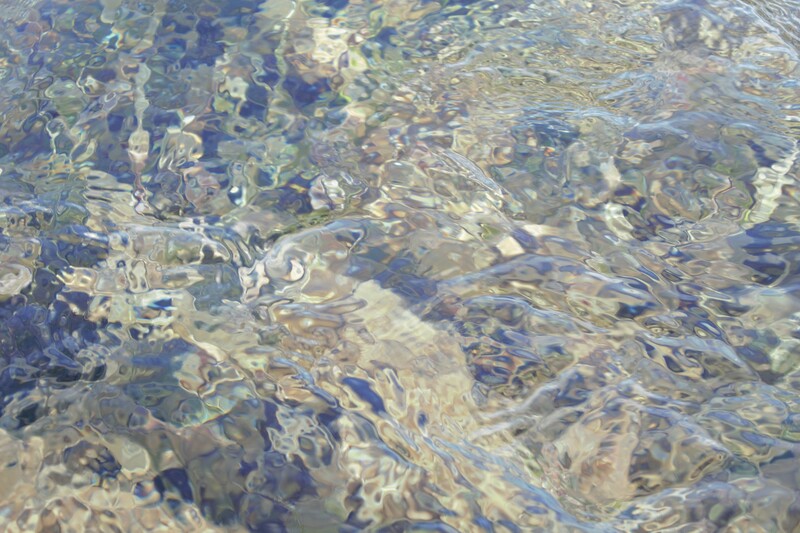 The water was crystal clear and you could easily pick out the bottom at 6 metres. 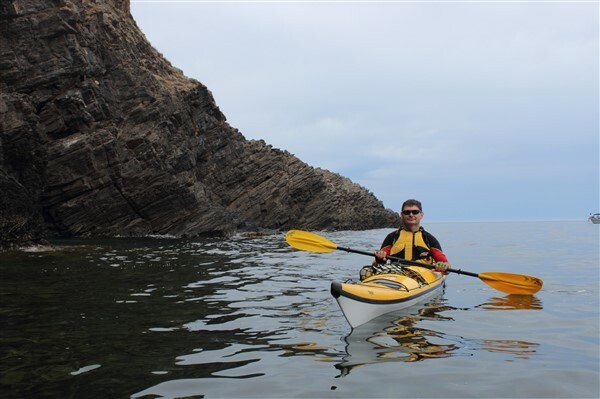 We explored a little along the rugged coastline. Whats around the corner ? We drifted along a little, with no plans to be anywhere at any particular time. ….and we were not the only ones enjoying the day. We are not alone. Three other kayaks also enjoying the day. 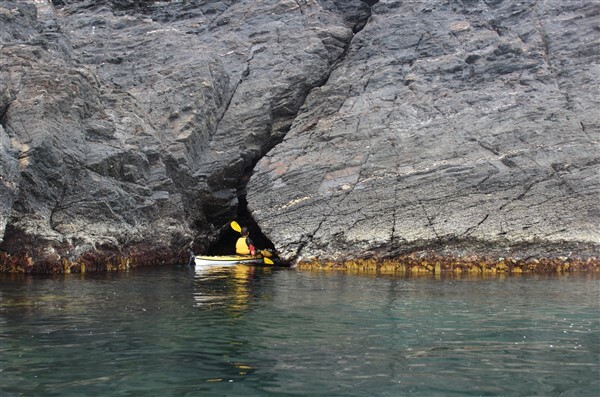 We got ourselves in a few tight places with the slightest of swells gently moving the kayaks in and out of rock crevices. It was a great day on the water. 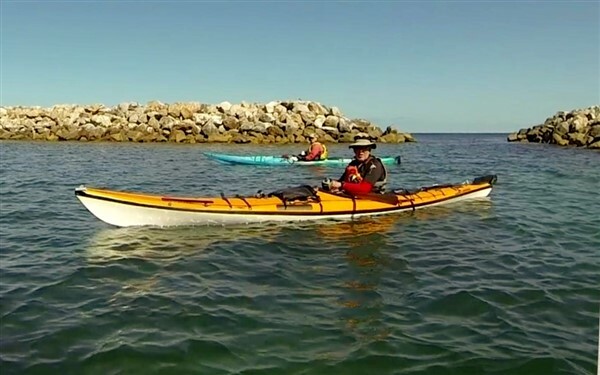 We just needed one more thing..and there he was ..the kayakers “Seal of Approval”. 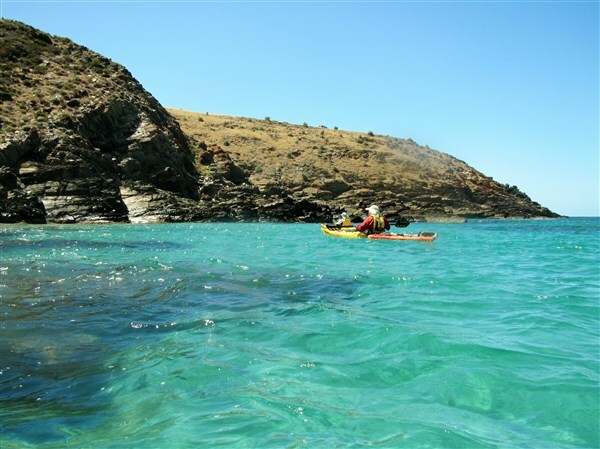 Sea kayak Day Paddle – Cape Jervis to Blowhole Beach. Actually there isn’t really a blowhole there, not like the type we normally think of where towering waves crash onto a rocky coastline sending plumes of spray skywards. 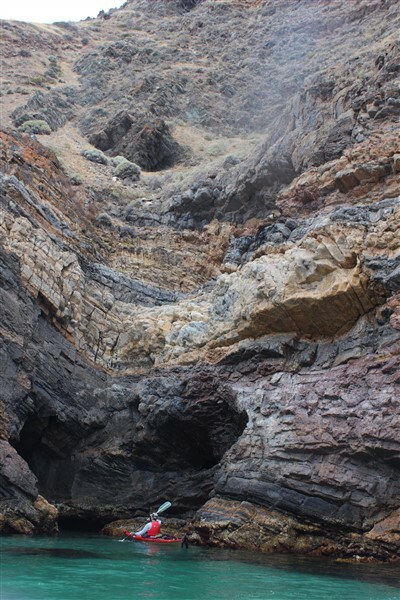 This is Blowhole Creek in the Deep Creek National Park and one of the picturesque beaches along this very rugged coastline. I have been visiting this beach for the last 40 years and the only thing that has changes is that you can now access it via a 4WD track from within the National Park. In the old days it was a rocky walk down a rough track or straight down the fence line on Cobblers Hill. 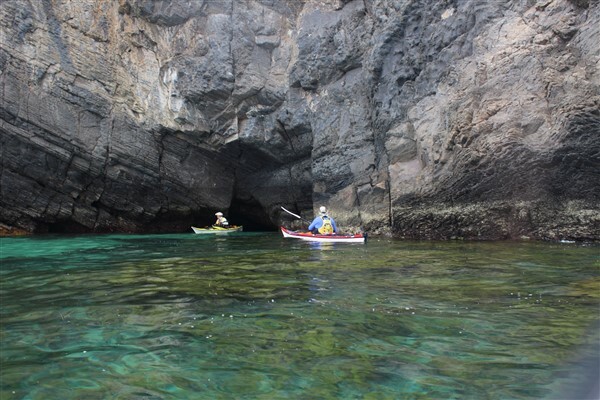 This area has a tidal stream of up to 3 knots as water empties and refills the Gulf St Vincent so all paddling needs to be planned with the tides. 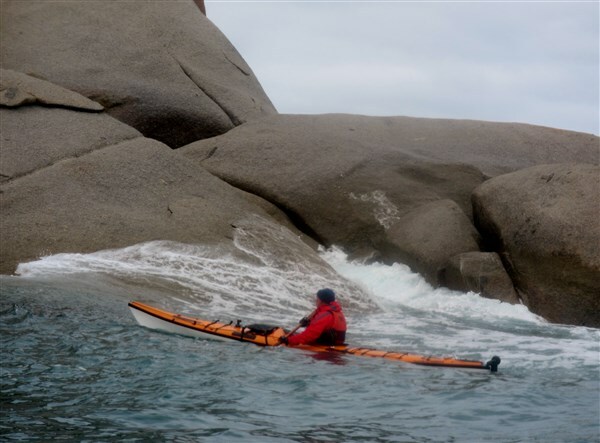 My many years experience paddling this coast have also taught me to be very cautious of forecasts and take more notice of the conditions at the time as well my own observations. 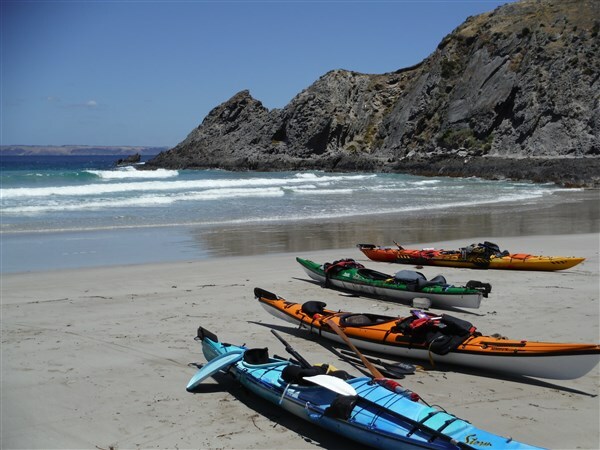 The weather forecast a couple of days out had been for smooth seas and light winds so we planned a trip along the coast from Cape Jervis to Blowhole Creek and return. 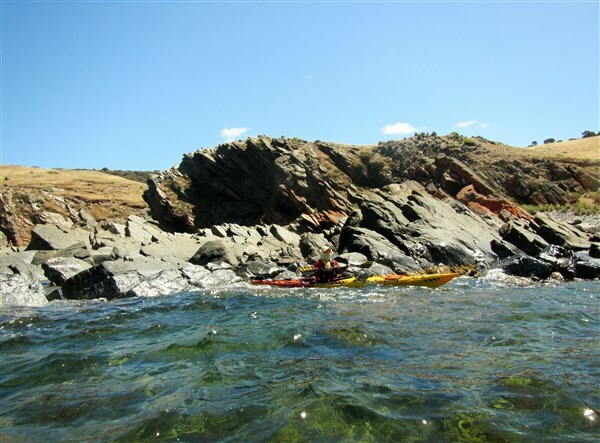 We gathered 5 local paddlers together with the idea of exploring the rocky coastline up close, if the weather forecast was correct. Arriving at Cape Jervis we found that the Backstairs Passage between the mainland and Kangaroo Island was just starting to have white caps on the horizon, stirred up by a Sou’Easterly breeze. 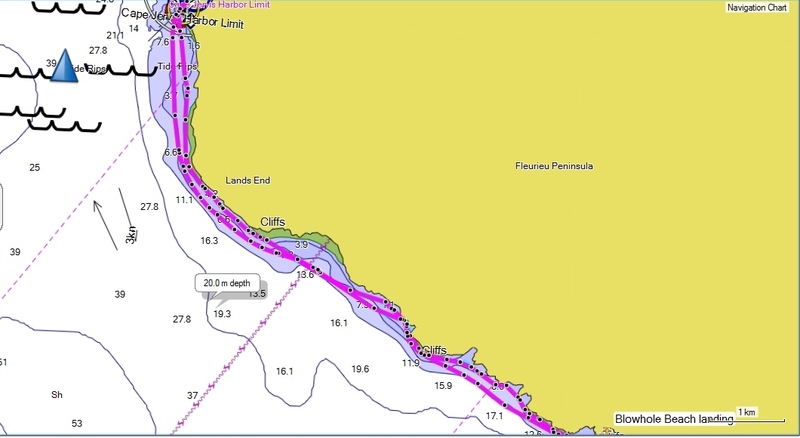 Great….another day of headwinds and certainly not what we had hoped for but inshore it would be much calmer. We got organised and waited in the shelter of the marina for the Kangaroo Island ferry to leave. Then we plodded off into the increasing gusts. Of course there is a shipping lane in Backstairs Passage so you need to keep a wary eye on the horizon. 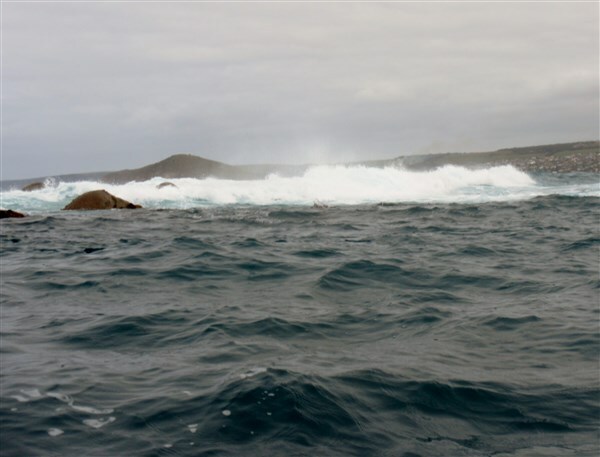 Heading out of the protection of Cape Jervis. Kangaroo Island in the distance. 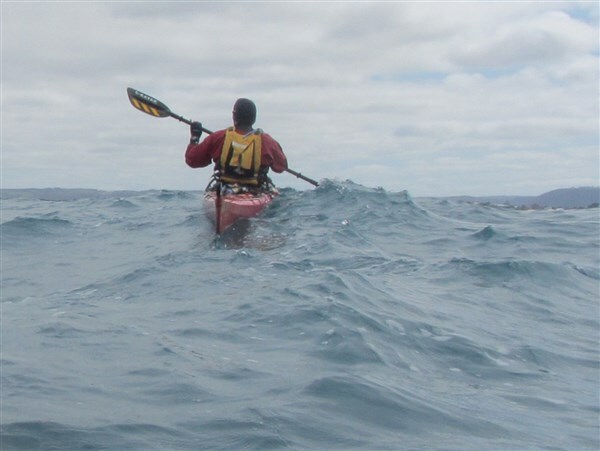 Looking at my GPS I thought “ Hey this was supposed to be an easy paddle riding the ebb tide, but we are only making 5km/hr in the strengthening wind. 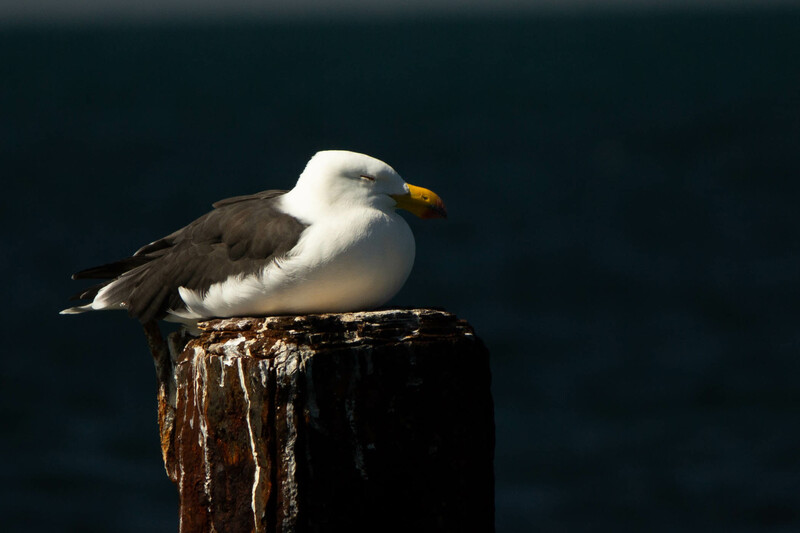 We decided to stay close inshore and use the headlands for protection from the breeze. 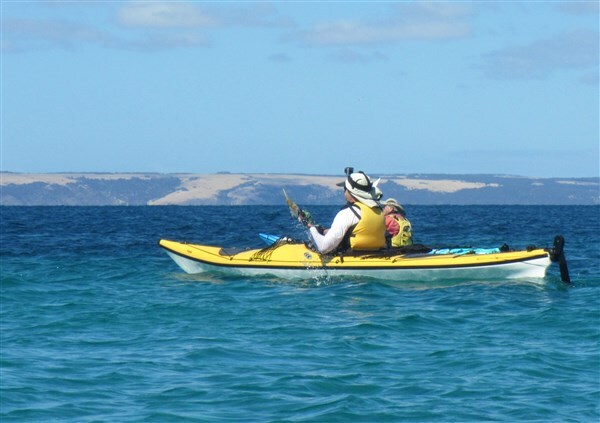 We reached Lands End and passed close in at Whites Beach where the underwater power cable goes to Kangaroo Island. 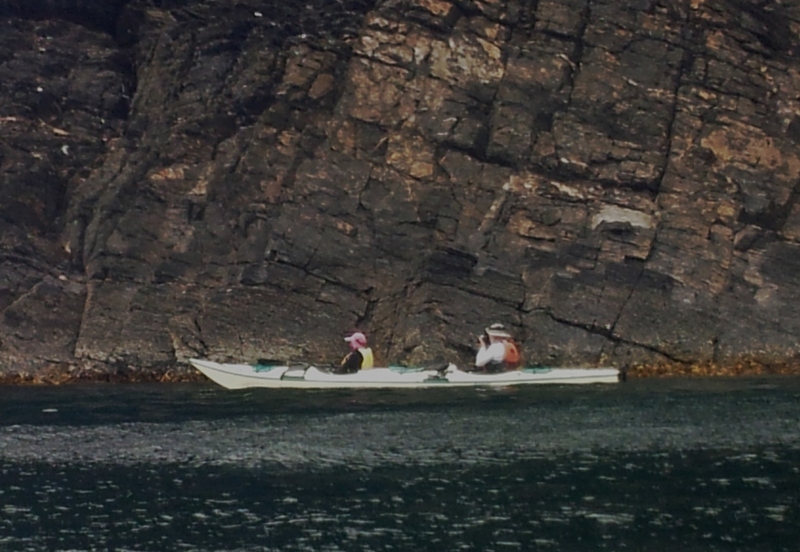 We soon arrived at the more interesting section of the paddle, where the steep cliffs fall straight into the water. 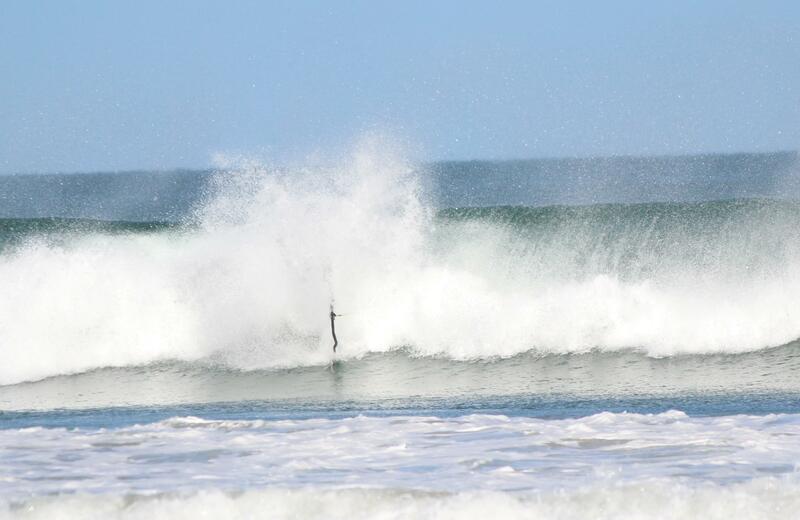 This allowed us to get up close and personal with the rocks and swell. 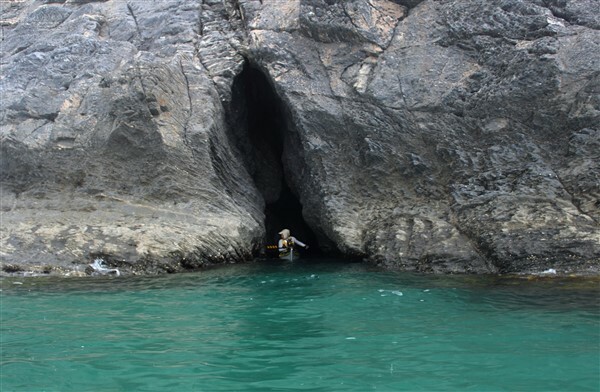 As usual Steve was found bobbing around among the rocks. 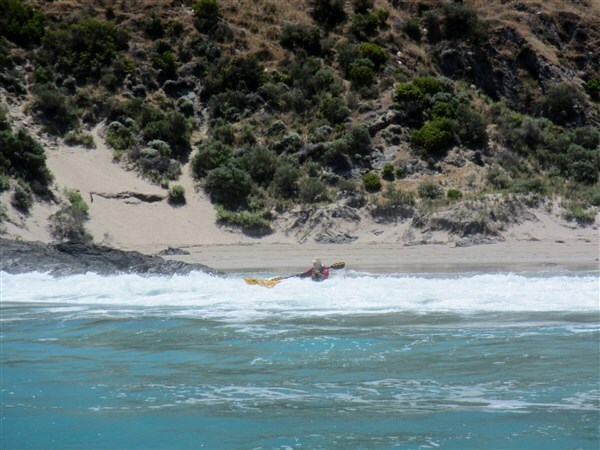 We “played” our way along the coast to Naiko inlet which is a small inlet with sandy beach. There we spotted the first signs of life for the trip. 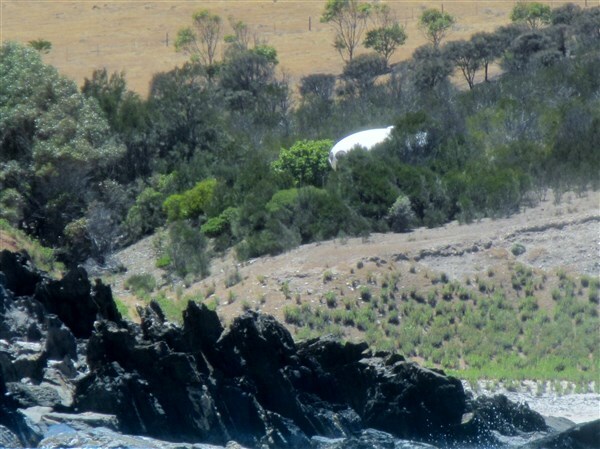 Maybe Alien life was a better description as we spotted a spaceship landed among the native bush. 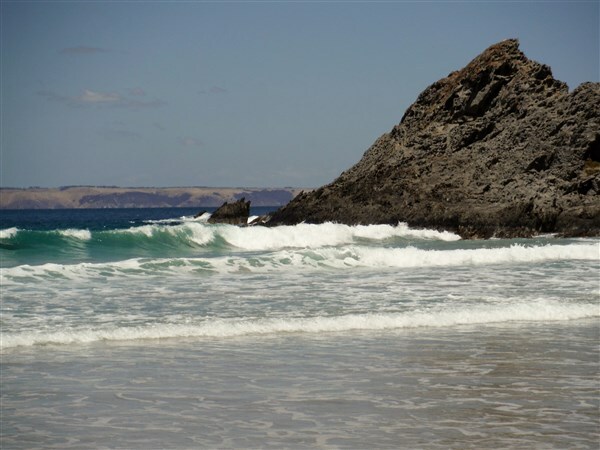 Soon Cobblers Hill was in sight with Blowhole Beach just around the headland. We could see bushwalkers on the Heysen Trail which runs 1200 km from Victor Harbor to Parachilna Gorge in the northern Flinders Ranges. A landing through small surf got us onto the pristine beach for lunch. Rodney surprised with a bowl of fresh strawberries, cherries and grapes to share. Who said he’s disorganised ?? 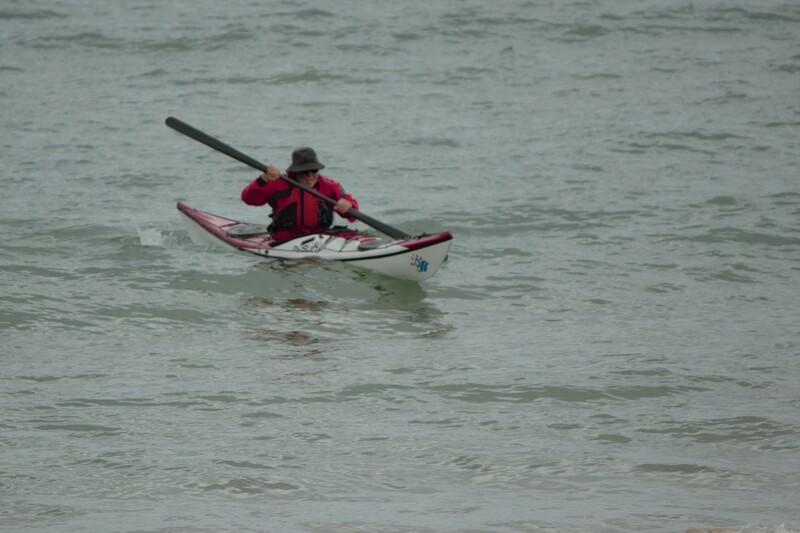 Then back on the water through a small surf we found that the wind had abated slightly but still gave us an easy ride home as we picked up the start of the flood tide. 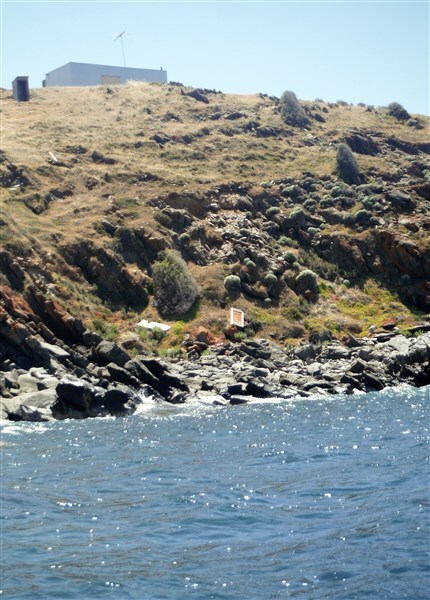 Many years ago some intrepid fisherman built a “get away” on the headland which is now complete with TV antenna. Unfortunately you can see that the “room with a view” has lost its’ door to a recent gale and now resides at the bottom of the cliff. Still your hardly likely to get too many interruptions here. We arrived back at Cape Jervis just in time to see the Kangaroo Island ferry heading out for Penneshaw. 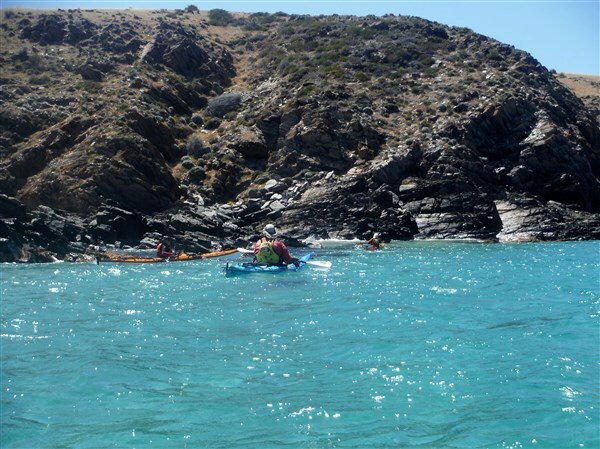 A great way to spend a day on this mainly deserted coastline with a pristine beach lunch stop. 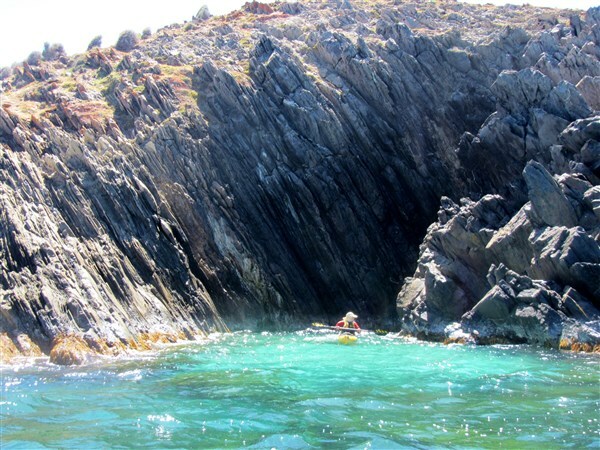 This is an excellent place for exciting paddling especially as the swell and associated clapatis increases. 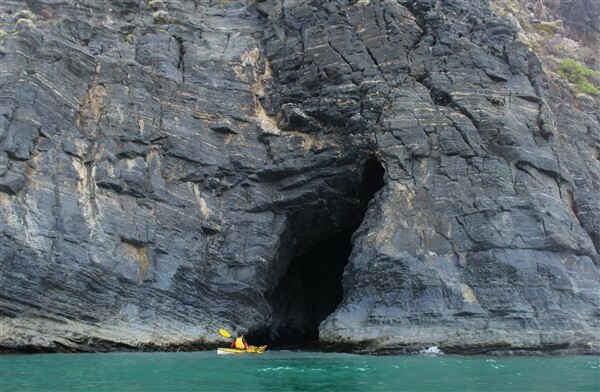 It should only be paddled by those with the appropriate sea skills and of course a properly fitted out sea kayak. Hazards. 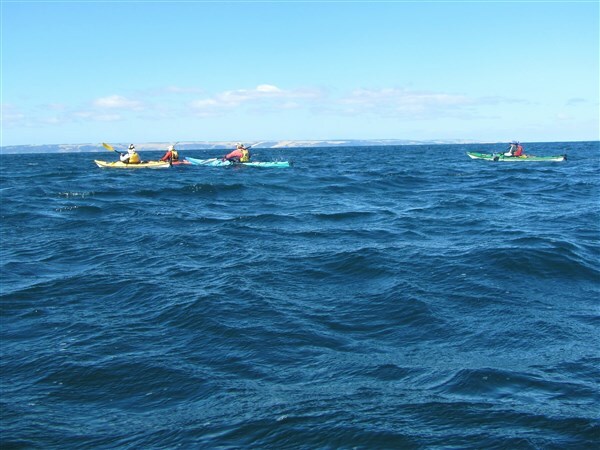 This area is subject to a tidal stream of up to 3 knots so paddlers must take this into account on all trips. Note that South Australia has “dodge tides” and more information is available from the Bureau of Meteorology website (bom.gov.au). 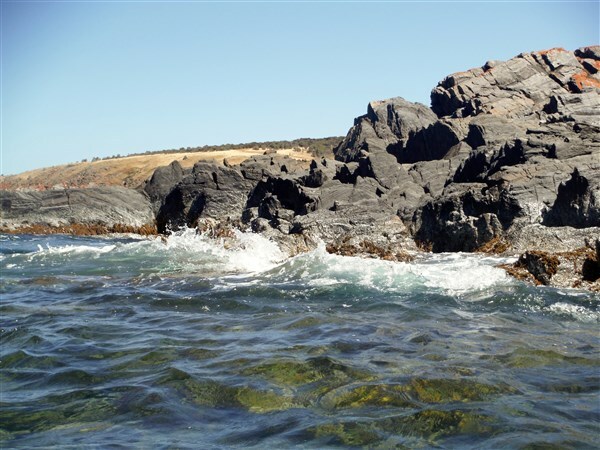 There are many reefy/rocky areas along the coast as well as the possibility of large breaking waves with the predominant swell being from the SW. 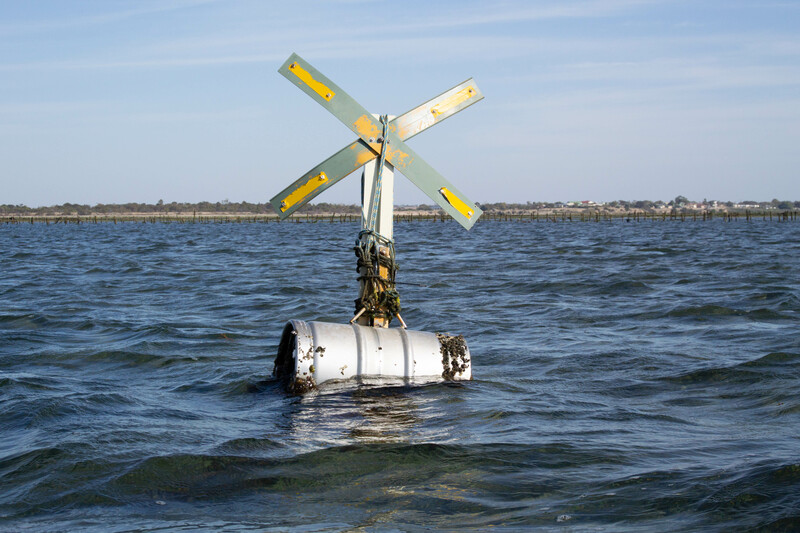 There are limited landing spots along this coast even in good conditions. Take care and seek local knowledge. 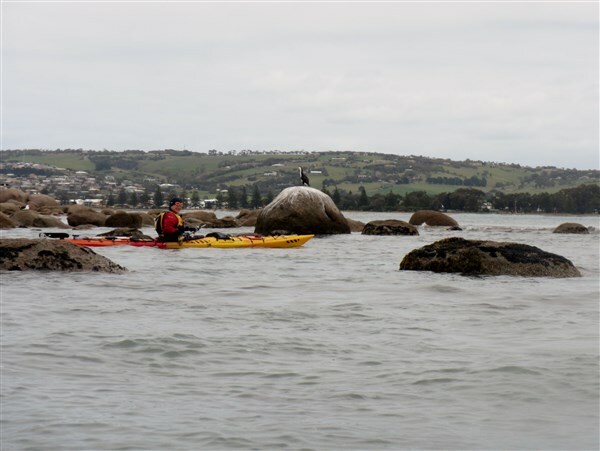 Sea kayak Day Paddle – Seal Island Victor Harbor. 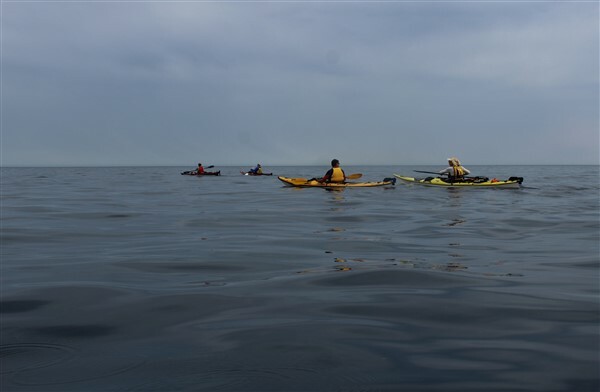 Well not so much a day paddle, more like a morning sojourn which can be everything from calm to crazy. 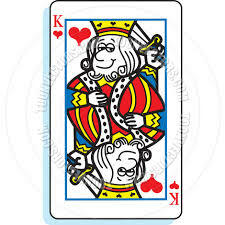 Today it was moving towards the crazy side. 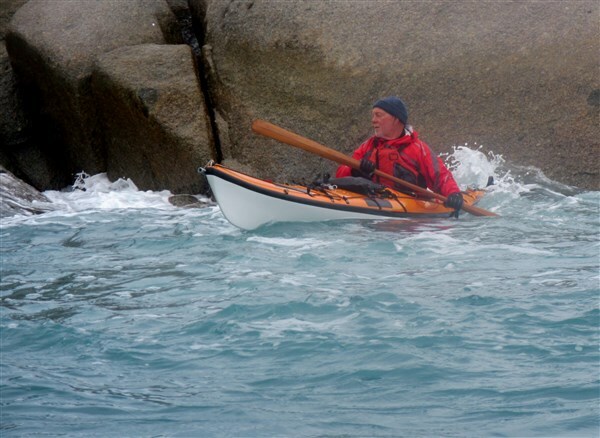 It’s the Spring Equinox today and you would think we could rustle up a little spring weather for our Spring Equinox paddle but it was nowhere to be seen. 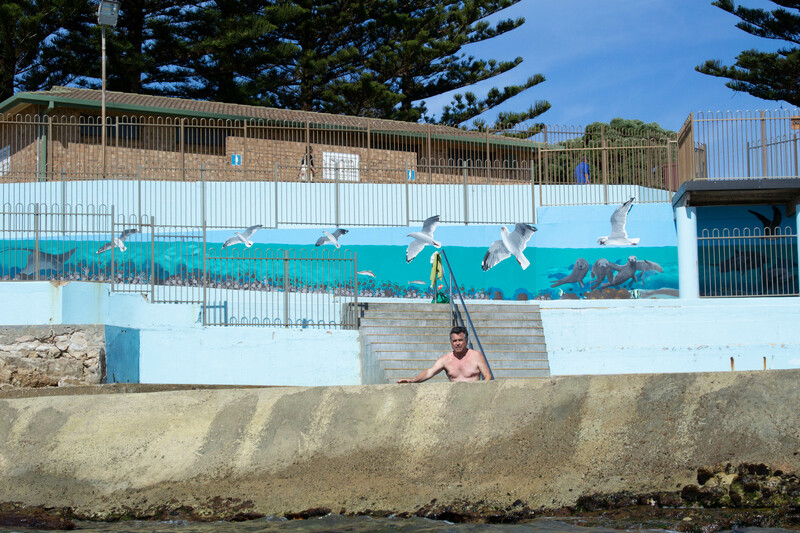 It was another of those strange days you get at Victor Harbor in Spring, where it promises sunshine but delivers cold overcast skies. The forecast was for gentle 10kn SE’ly winds with clear skies but the reality was a 15-18kn SE’ly wind opposing a 2 metre SW swell, overcast skies and a temperature around 13C. 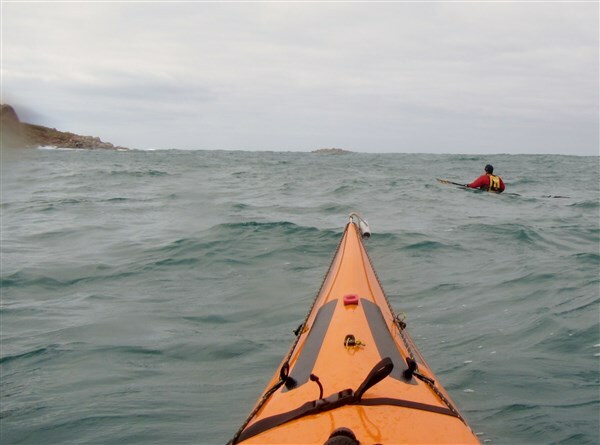 Not ideal conditions for this area today and even under ideal conditions you should have good “sea kayak skills” to paddle this area. However, two of us were standing on the beach with not much else to do except get cold and wet so off we went. 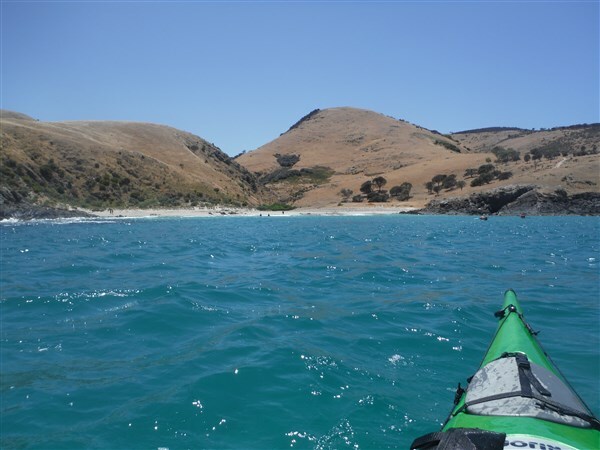 The plan was to paddle from Kent Reserve towards Granite Island, skirting an area of reefy breaks and bommies, then head out to Seal Island, returning via the eastern side of Granite Island. 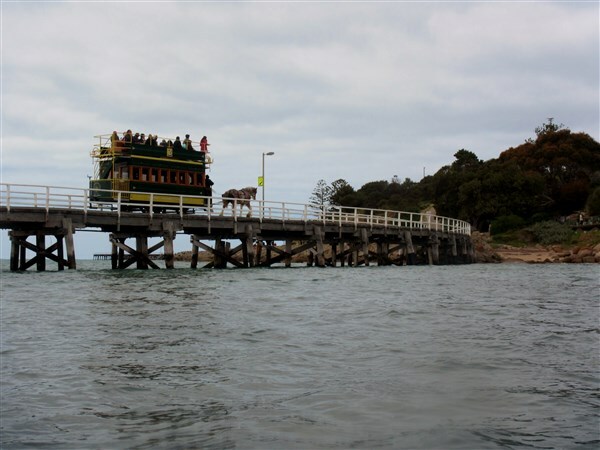 We headed out getting some protection from Granite Island. Although the seas soon became confused with wind against swell. 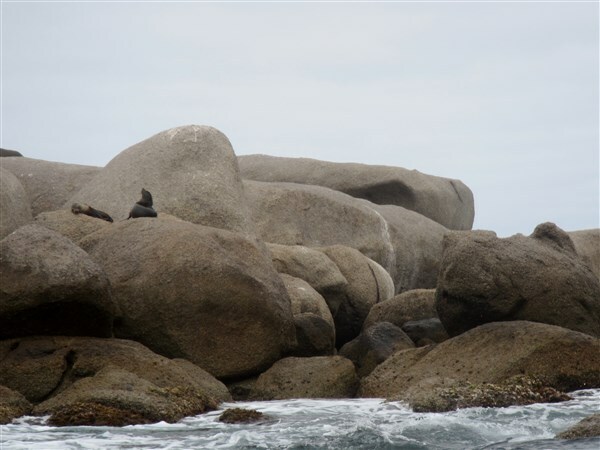 We worked our way out around the various reef breaks .Seal Island is protected by a number of reefy breaks and today all of them were savage. 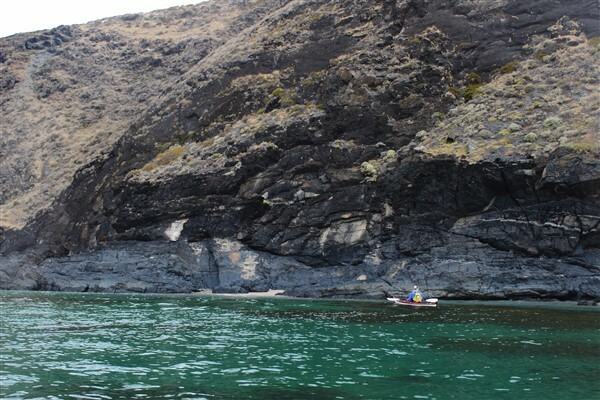 We reached a small protected area near Seal Island. 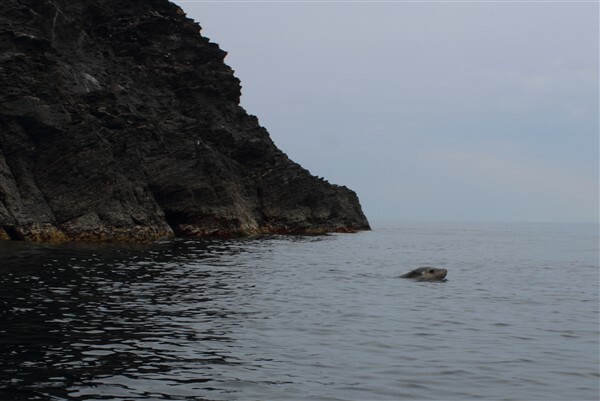 Even the seals decided it was too rough to come out and greet us. Steve was a very happy boy to find a little sheltered spot. 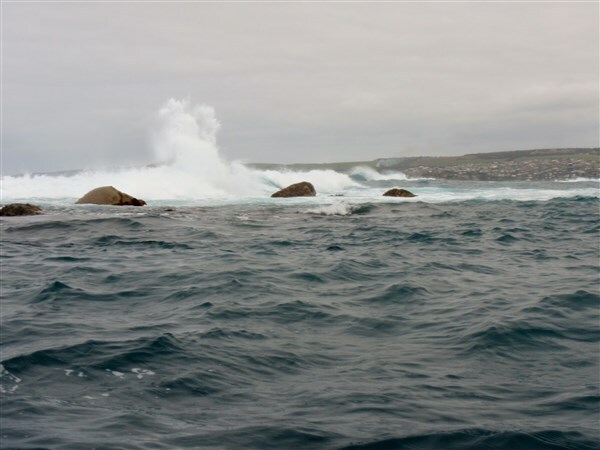 After our short visit with the seals we headed back towards the eastern side of Granite Island with a large lumpy following sea. Again photos were a little difficult to get. 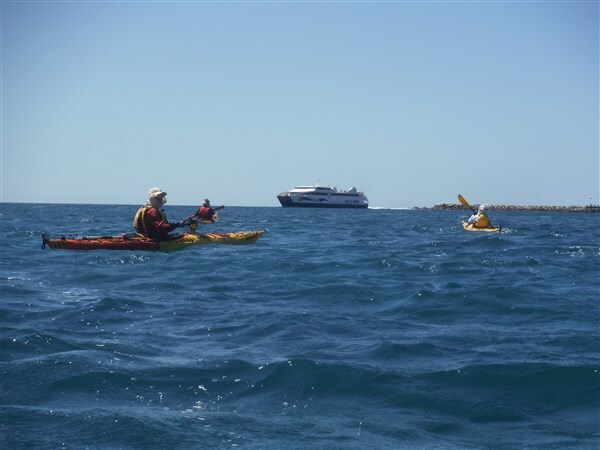 Once around the breakwater we were in calm water. 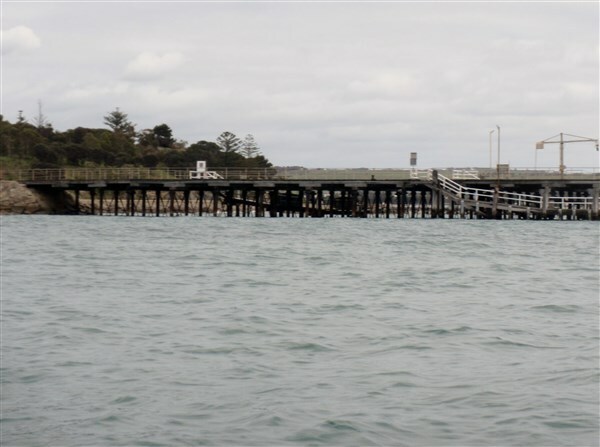 Then onward past the jetty. 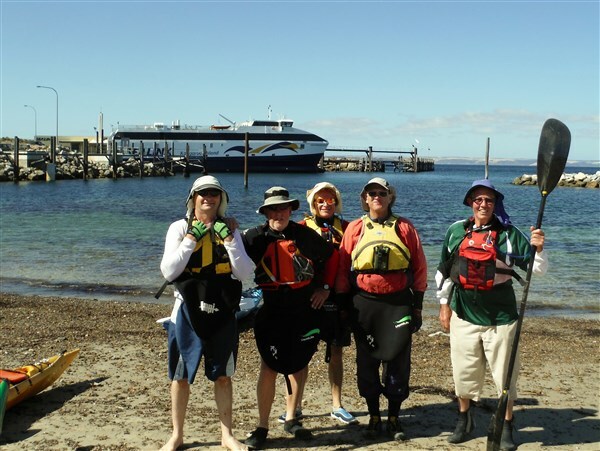 We watched the tourists on their way onto Granite Island aboard the horse drawn tram…..
…and then spent some time playing amongst the rocks. 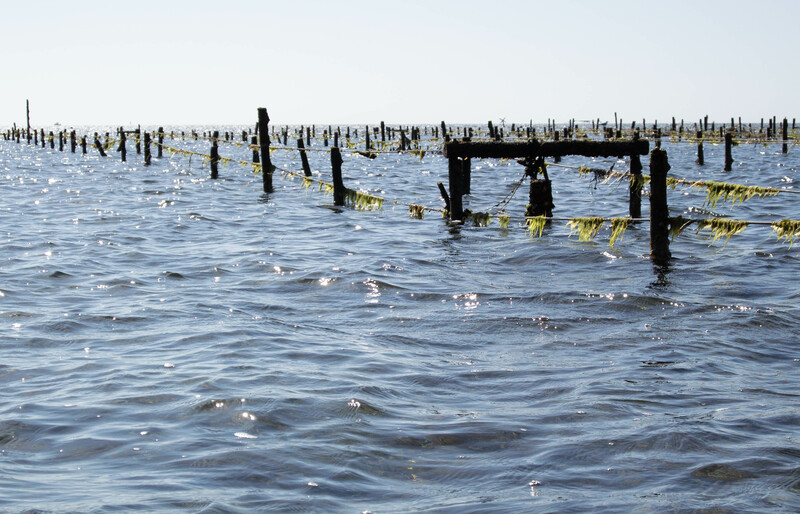 Protected waters. Encounter Bay township in the distance. A great morning of paddling to celebrate the Spring Equinox. Now where’s my mountain bike ? I’m heading north to where it’s warmer. 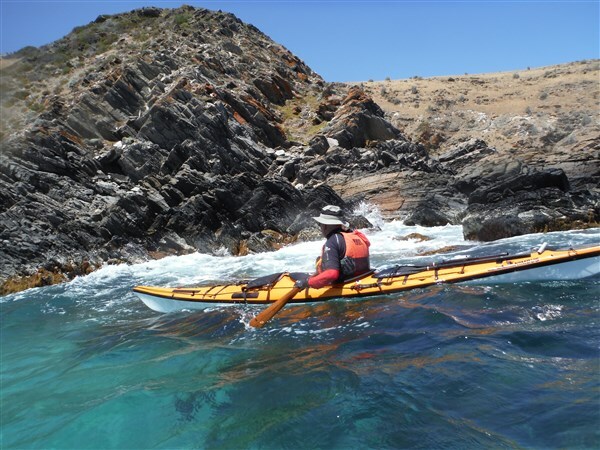 Ian…Paddling South. Hazards. 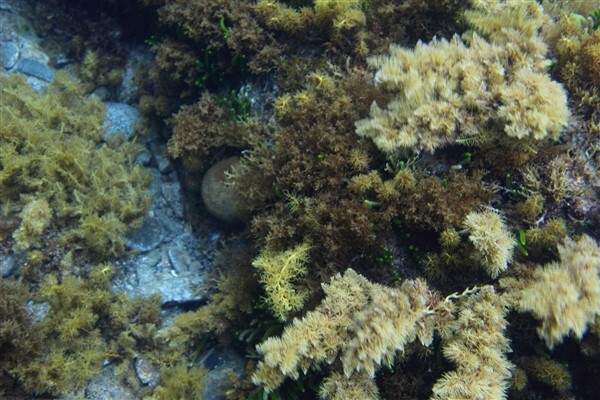 A number of dangerous rocks are charted as well as reefy areas. 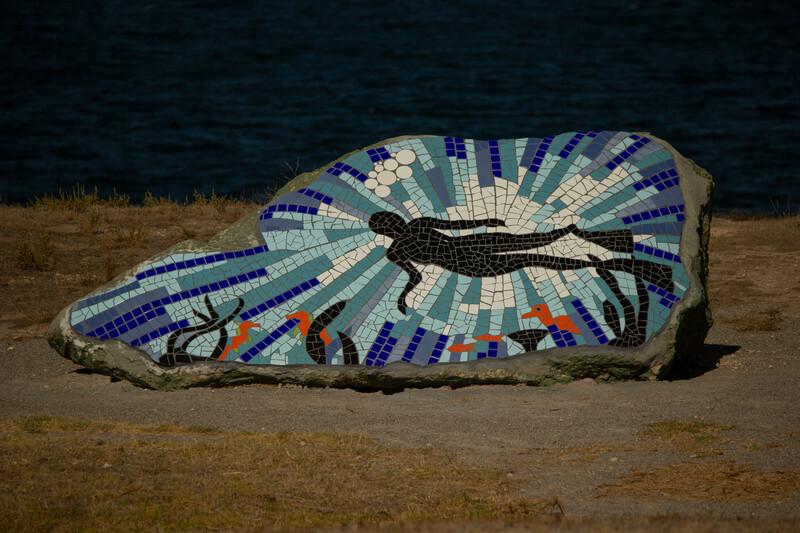 Clapatis from Granite Island can make for a very confused sea in some places. 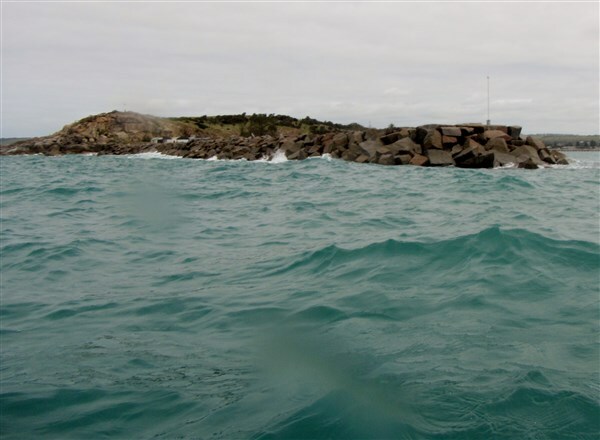 Swell may break near Granite Island. 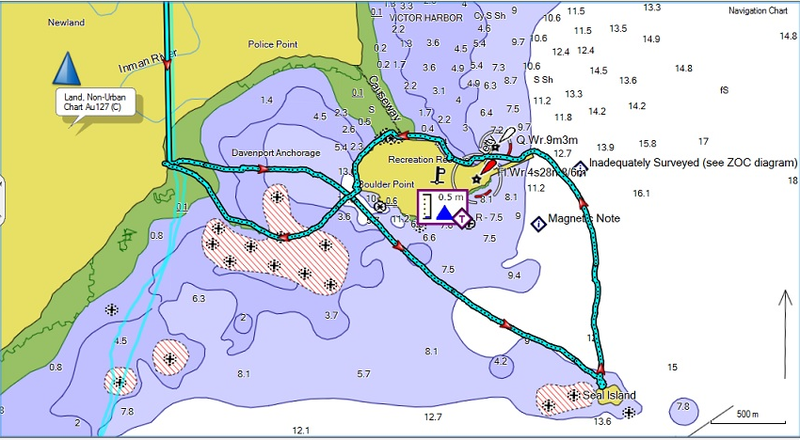 Consult marine chart before attempting. 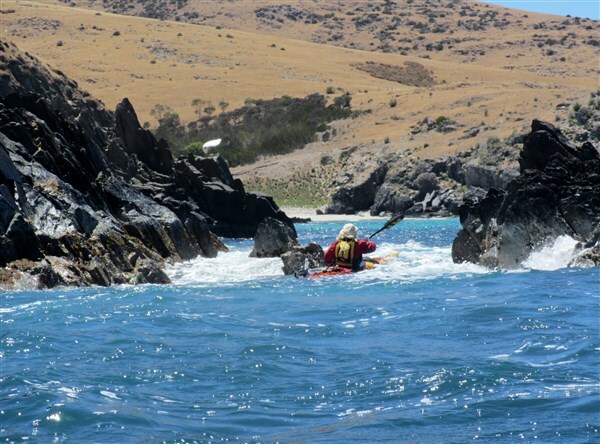 Avoid paddling close to south side of Granite Island due to large swells breaking and dangerous currents.